Cooperation over transboundary rivers, lakes and aquifers is critical to ensuring that water resources are managed in an equitable and sustainable manner, and the achievement of SDG6 (water). Transboundary waters also create social, economic, environmental and political inter-dependencies that make cooperation a precondition to sustainable development, peace and security. 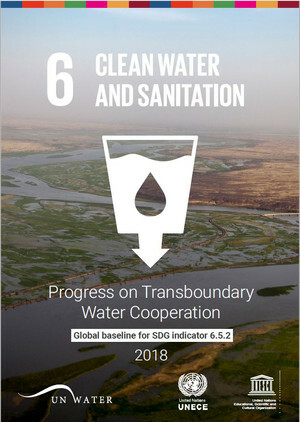 As the only target in the 2030 Agenda for Sustainable Development that makes explicit reference to transboundary cooperation, target 6.5 can play a catalytic role across multiple SDGs and targets. It can generate multiple benefits for the protection of human health, renewable energy provision, sustainable agriculture, climate adaptation, ecosystem protection, and peace and security. This publication presents the results of the initial reporting exercise on indicator 6.5.2 carried out in 2017-2018. It offers valuable insights into the progress achieved in establishing operational arrangements for transboundary waters, and the gaps that remain; and highlights that an acceleration in strengthening transboundary water cooperation is urgently needed to be able to face growing water challenges and prevent conflicts on water use. This report is part of a series that track progress towards the various targets set out in SDG 6 using the SDG global indicators. To learn more about water and sanitation in the 2030 Agenda for Sustainable Development, and the Integrated Monitoring Initiative for SDG 6, visit the website: www.sdg6monitoring.org.